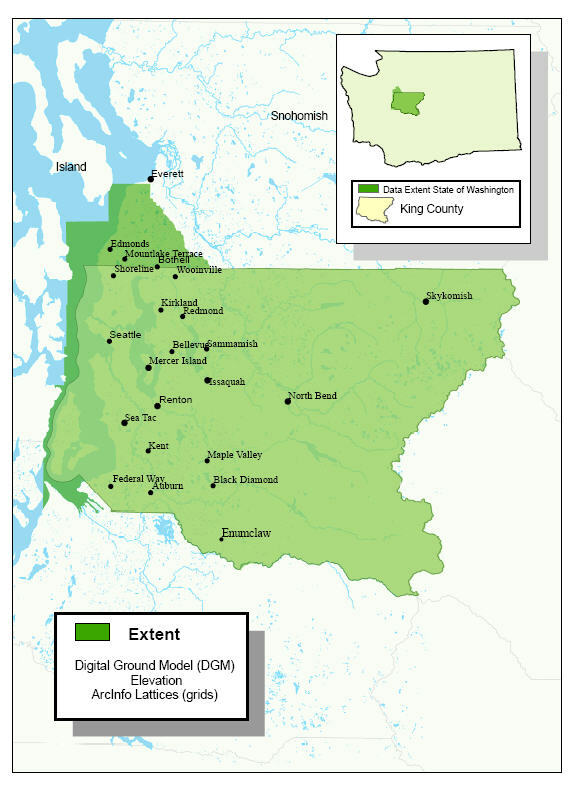 Abstract: Also known as bare-earth digital elevation model (DEM), Virtually-Deforested (VDF) model and Mowed Surface. It is an interpretation of the earth’s surface where 90-95% of vegetation and man-made elevated features have been removed. No additional filtering or interpolation is performed on variably-space mass points prior to TIN creation and conversion to 6-foot posted ArcInfo lattice. Elevation value is in feet. A hillshade grid is created from elevation lattice with default ArcInfo parameters and converted to TIF and compressed image format with same 6-foot posting dimension. The primary user data set is tiled to township-range bounding scheme. Data also available as TINs with a 0.0 proximity tolerance and no breakline coding, and as id,x,y,z ASCII file. A DGM is comparable to the USGS National Elevation Database DEM, but in a dataset of much higher resolution and accuracy. \\gisdw\kclib\plibrary3\idxp7500\dgm_ascii as compressed zip files. What about using the data? 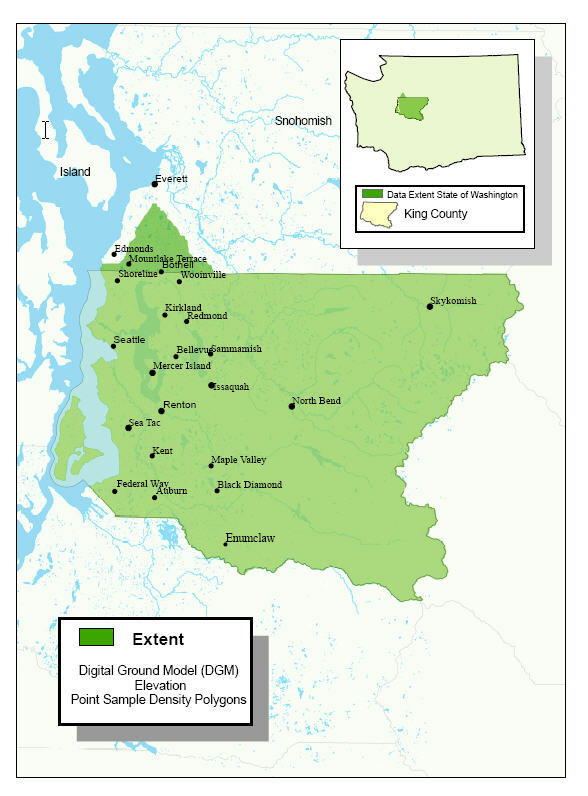 Most GIS data users will not have a need for this format. This format is tiled at the 7500 ft tiling level and is useful for large-scale, detailed mapping, but the records will need to be imported into your software program for display and contour generation. Be aware the files are quite large – 1 to 2 million records per tile. 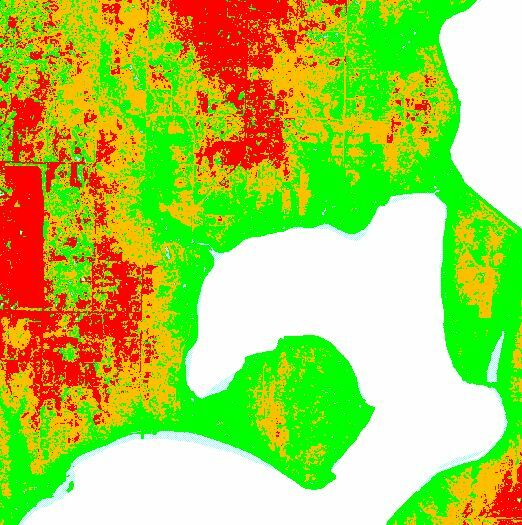 This somewhat specialized data format is not for most GIS users’ analytic procedures or cartographic needs, but serves as a ‘building block’ for creating higher-resolution elevation derivatives, especially for large-scale applications. To use TINs directly requires the 3-D Analyst software extension. Because the TINs were created without any proximity filtering, the node (point) locations provide the same level of control as the ASCII point files. Like the ASCII files they are found only at the idxp7500 level. This is the place for users to get elevation data if they use Spatial Analyst software for accessing and querying ArcInfo Grids. The grids have a 6-foot center-to-center cell resolution so are useful for most applications at the township-range tile level. However, those requiring higher resolution grids should not resample this grid but rather should reextract the grid from the underlying TINs at the required higher resolution. What are does it cover? 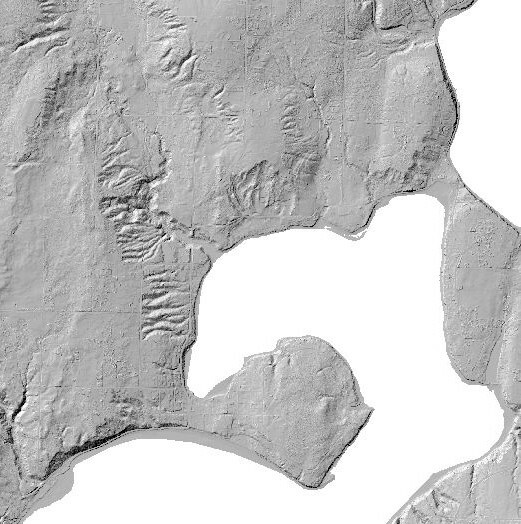 A hillshade is a good way to get an overview of the topography and for producing shaded relief maps in conjunction with the elevation grid. As an image it is readable by all GIS/CAD software and many other image readers. The hillshade is derived directly from the underlying township-range elevation lattice so it has a resolution of only 6 feet. Use the TINs to derive more detailed products as necessary. As with other images in Plibrary3, the hillshades are provided in both TIFF and compressed formats. 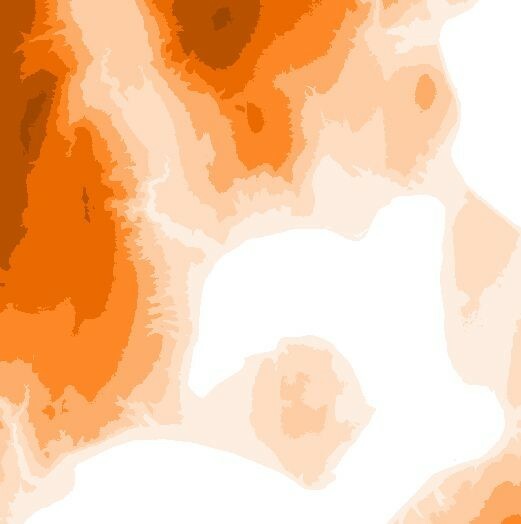 Abstract: Lidar bare-earth lattices at a 6-foot posting interval contoured to create a topographic surface interpretation. A five-foot contour interval is used for elevation ranges less than 1000 feet with a 10-foot interval used from 1000 feet on up. Some township tiles labeled as _ctr005 may contain areas that are above the 1000-ft threshold and display only 10-foot contours. Likewise, some tiles with a 010 filename extension may contain sub-1000 foot areas with 5-foot contours.The vector files have also been converted to DXF format at the 7500-foot tiling scheme. Index contours are attributed with different index schemes. Lattice smoothing and vector generalization/splining is used to increase usability of theme for cartography while maintaining a high-level of fidelity and accuracy. Primary user data set is tiled to the township-range bounding scheme. \\gisdw\kclib\plibrary3\idxptrmbr\dgm_contour for shapefile versions and \\gisdw\kclib\plibrary3\idxp7500\dgm_contour for DXF versions. 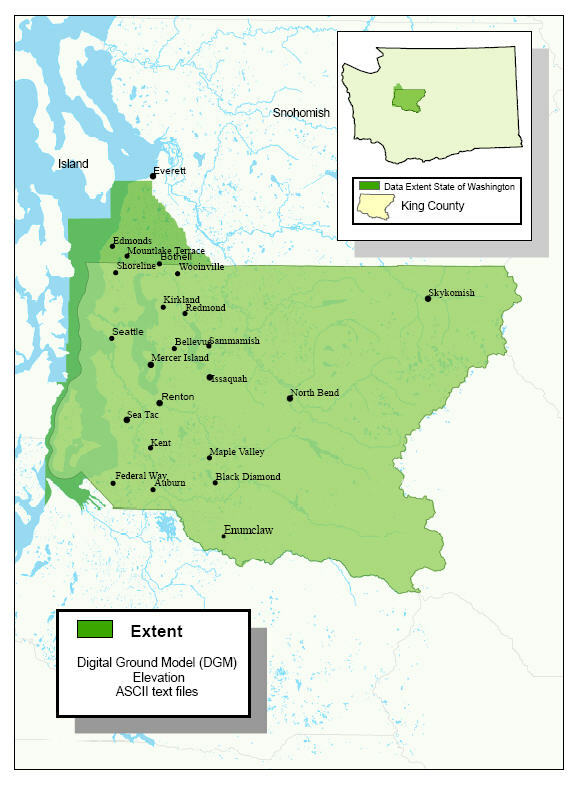 A representation of the ground model in vector format for use in all GIS and CAD software. Contours are generated from the underlying township-range lattice tile; version one is not edge-matched with adjacent tiles. Contours are attributed with several index levels for ease in subselection and symbolization. As a derived product of the raw elevation data, users should be aware of limitations in use of this data. Please review the accompanying metadata. Abstract: Lidar bare-earth points distribution classified to a generalized point density polygons and coded as low, medium or high density. Substantial interpolation and smoothing is applied in order to create a reasonably detailed depiction relative to file size. 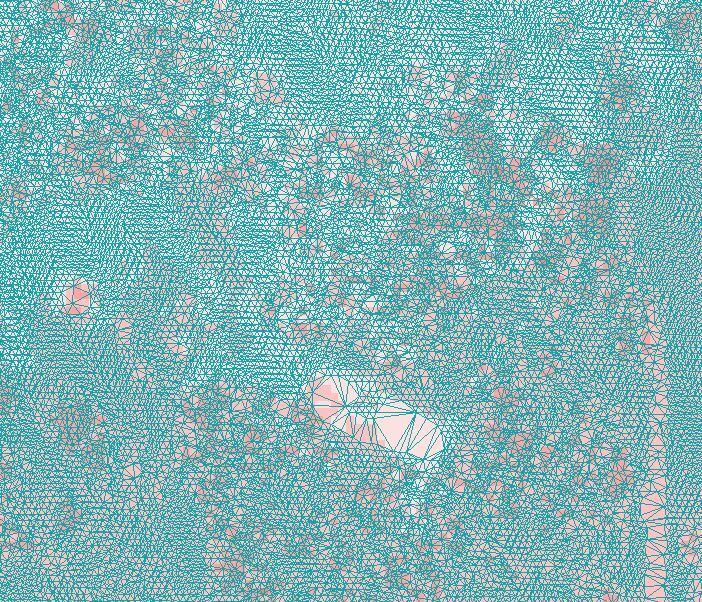 ArcInfo GRID PointDensity command is executed against points extracted from the TINs, resampled and then cleaned to shapefile polygons. 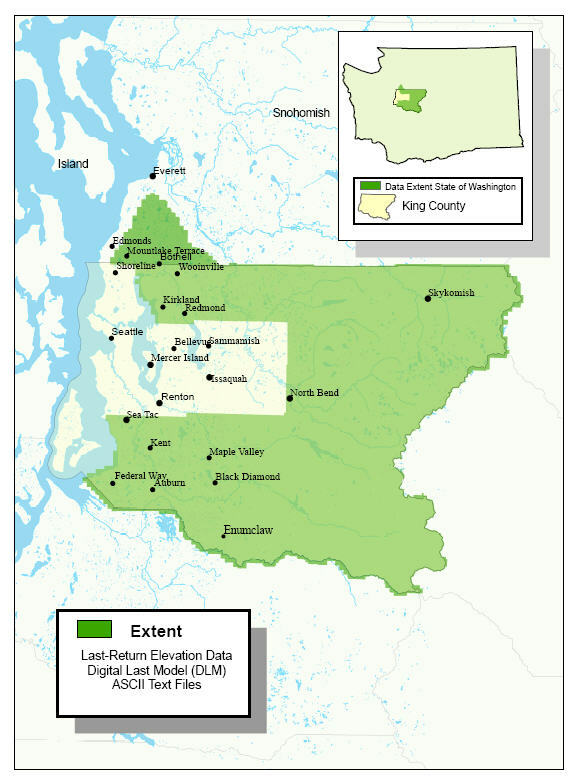 The primary user data set is tiled to the township-range bounding scheme. The lidar process provides more accurate and denser control than earlier elevation models. However, the amount of control (i.e., laser reflections that reached the ‘true’ ground) varies significantly, mainly due to the amount of crown and sub-canopy vegetation. This polygon file provides a simplified guide to the density of sample points per unit area, thus an indicator to how accurate and detailed the elevation model is for that area. More detailed density analyses, if needed, should be interpreted directly from the ASCII point files. Abstract: Also called top-of-vegetation or full-feature surface. Lidar x,y and z values obtained from the first-return lidar pulse, with no segregation as to whether surface is manmade or natural. No editing or smoothing performed on the variably-spaced mass points prior to TIN creation and conversion to a 6-foot posted ArcInfo lattice. Elevation value is in feet. A hillshade grid is created from the elevation lattice with default ArcInfo parameters, and then converted to TIF and compressed image format with same 6-foot posted dimensions. Primary user data set is tiled to the township-range bounding scheme. Data is also available as TINs with 0.0 proximity tolerance and as ASCII files in id, x, y, z format. 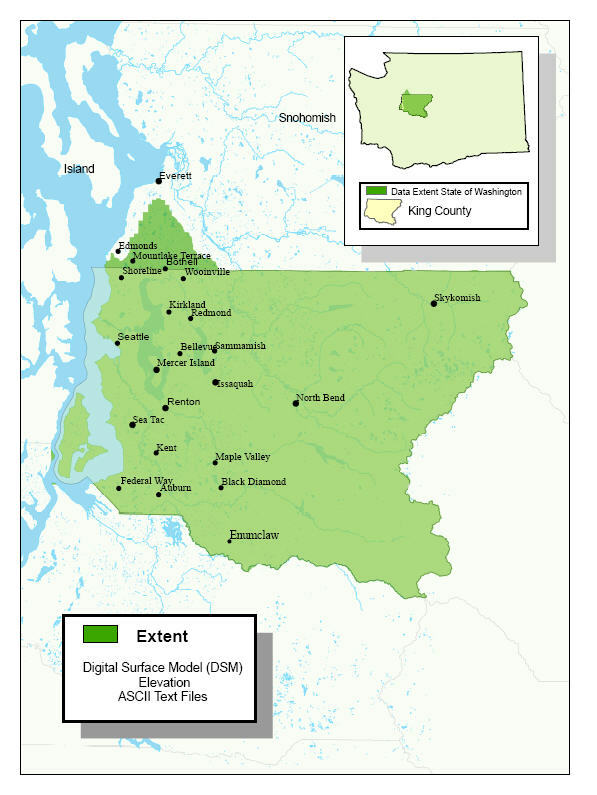 Most GIS data users will not have a need for this format. This format is tiled only at the 7500 ft tiling level and is useful for large-scale, detailed surface interpretations, but the records will need to be imported into your software program for display and contour generation. Be aware the files are quite large – up to 4 million records per tile. 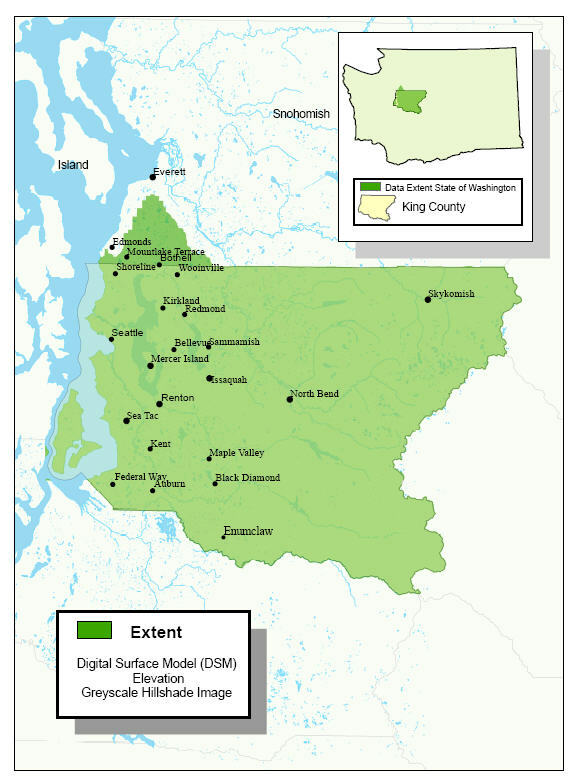 In areas where there was a sole lidar return the DSM, DGM, and last-return (DLM) contain coincident points. 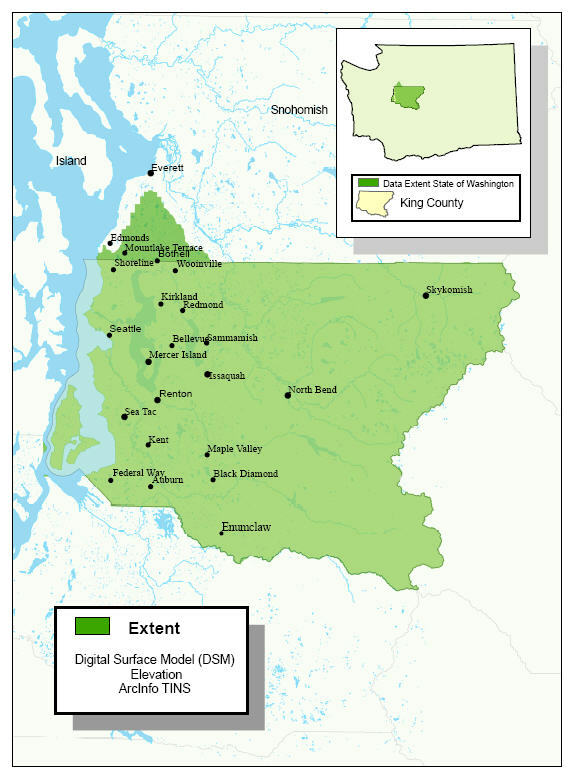 This somewhat specialized data format is not for most GIS users’ analytic procedures or cartographic needs but serves as a ‘building block’ for creating higher-resolution elevation derivatives, especially for large-scale applications. Because the TINs were created without any proximity filtering, the node (point) locations provide the same level of control as the ASCII point files. Like the ASCII files they are found only at the idxp7500 level. Requires 3-D analyst for direct viewing and manipulation. 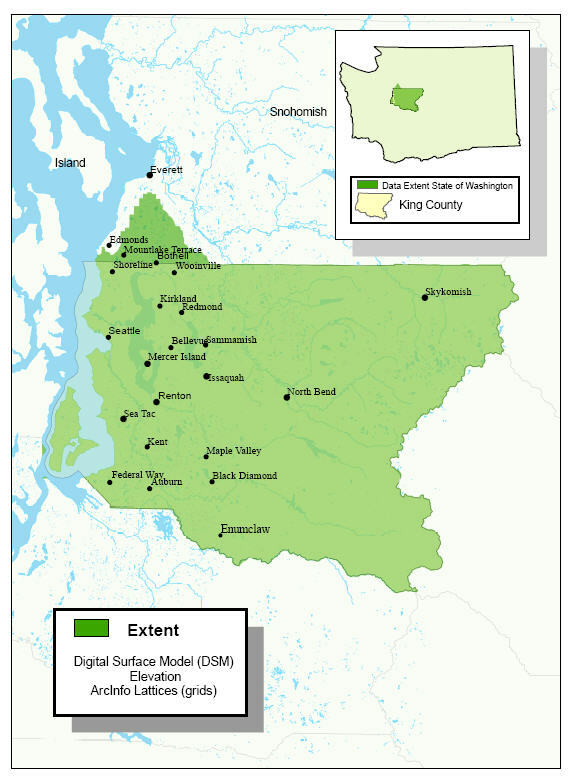 This is the place for users to obtain top-of-surface elevation values if they use Spatial Analyst software for accessing and querying ArcInfo Grids. The grids have a 6-foot center-to-center cell resolution so are useful for most applications at the township-range tile level. However, requirements for higher resolution grids should not resample this grid but should rather reextract the grid from the underlying TINs at the required higher resolution. Useful in conjunction with last-return and bare-earth models for calculating surface separation difference with potential applications in biomass calculation, building height delineation, etc. 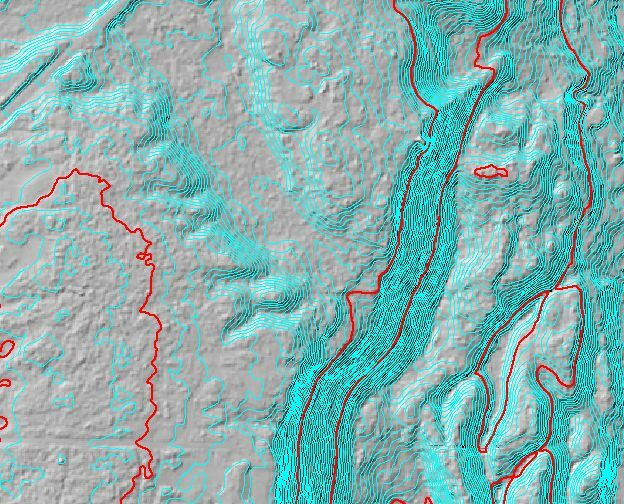 Unique top-surface picture, the hillshade is a good way to get an overview of the generally highest features and for producing shaded relief maps in conjunction with the DSM elevation grid. Building and other manmade features are defined. As an image it is readable by all GIS/CAD software and many other image readers. The hillshade is derived directly from the underlying township-range elevation lattice so it has a resolution of only 6 feet. Use the TINs to derive more detailed products as necessary. As with other images in Plibrary3, the hillshades are provided in both TIFF and compressed image format. Abstract: Lidar last-return variably-spaced mass point data in id,x,y,z ASCII format. Only data from the 3di (King County) project was retiled for warehouse delivery. No additional editing or processing of data was performed except for quality control evaluation steps. TINs and lattices created during quality assessment were not preserved. 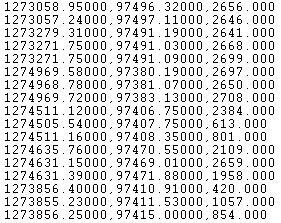 Only the ASCII format of the elevation data is available and only at the lowest-tier index level, idxp7500. For consistency with the DGM, DSM naming convention, this set is also referred to as DLM, for digital last model. 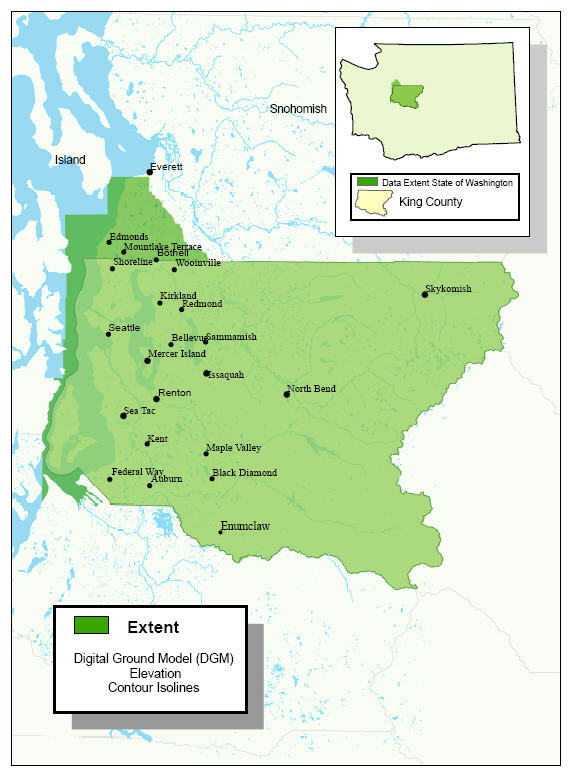 Most GIS data users will not have a need for this format. 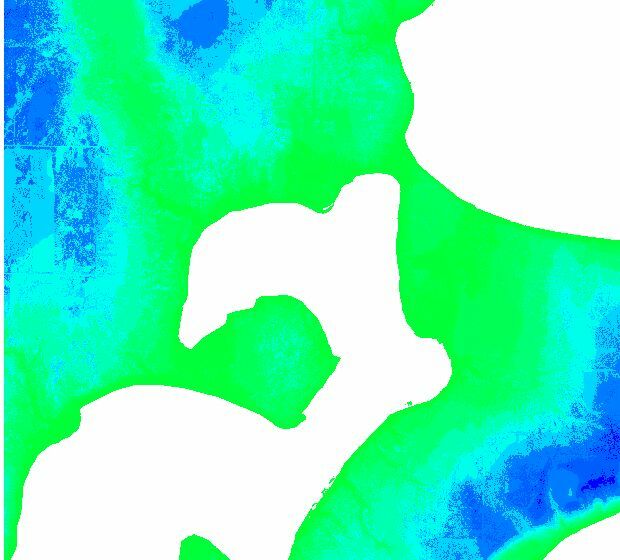 This format is tiled only at the 7500 ft tiling level and is useful for large-scale, detailed mapping where knowledge or resolution of subcanopy is of interest. Also useful for reviewing the superset from which the bare-earth files were extracted. Contains same points as DGM and DSM files where only a sole lidar return was obtained. Abstract: Lidar intensity data representing relative laser pulse intensity for both first- and last- return. 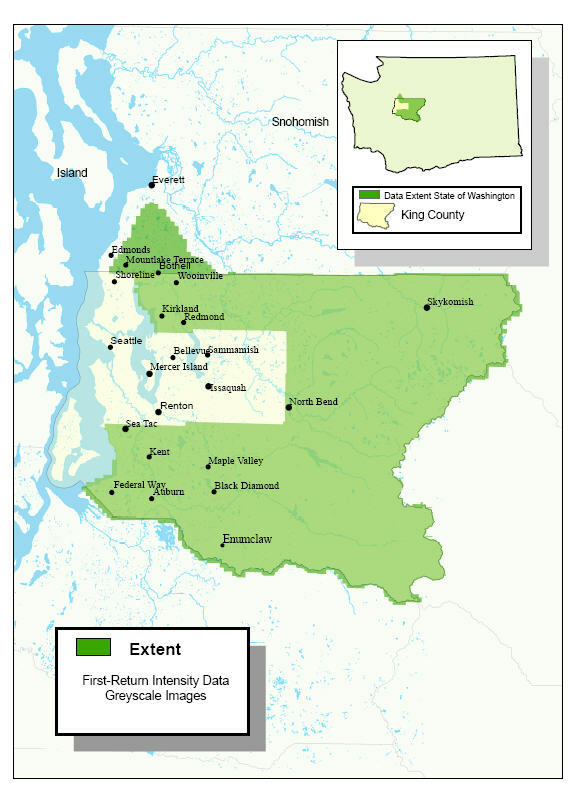 Data is available only for King County (3di) portion of project area. 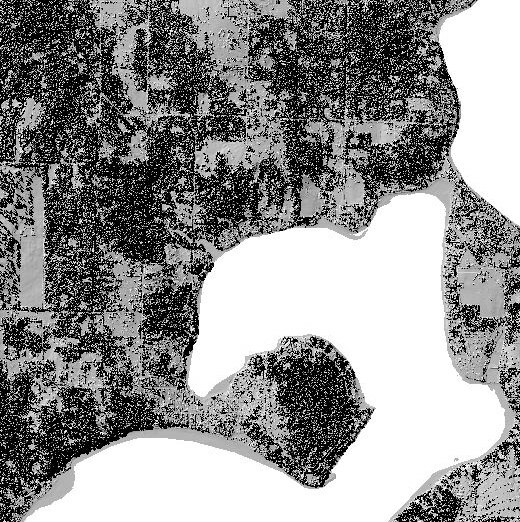 Vendor variably-spaced points were histogram-equalized and converted to panchromatic GeoTiff images at 1-meter resolution. Images were gridded, mosaiced to user township-range tiles and converted back to TIF and compressed image format. Separate last-return and first return mosaics are available in 8-bit panchromatic format. Data is also available as x,y, intensity value ASCII files. \\gisdw\kclib\plibrary3\idxp7500\fri_ascii and lri_ascii as compressed zip files. Data will be useful for those requiring details regarding the intensity value of the lidar pulse without any resampling or balancing of values that is done for the image format. There is not key relationship between the elevation records and the separate intensity records; any correlation must be done on spatial coincidence. The laser technology captures a return pulse intensity in addition to measuring the transit distance. 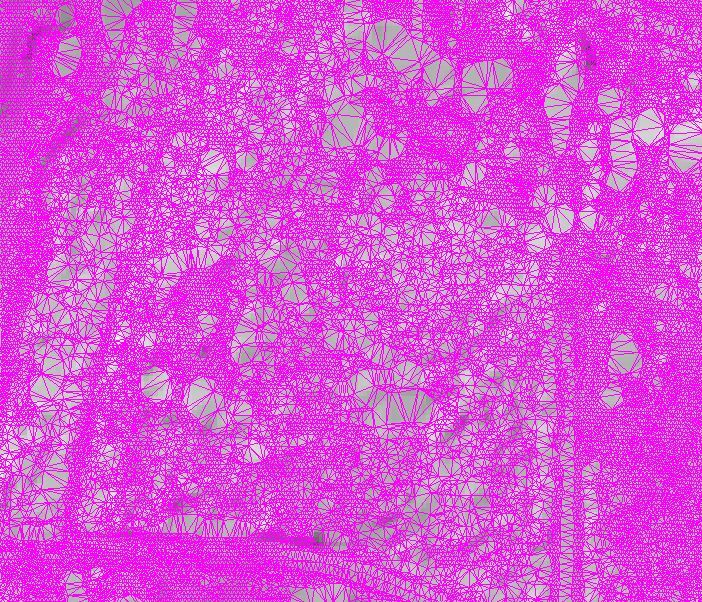 The image generated by the intensity values can be used as a guide to the type of surface and density of canopy during acquisition. 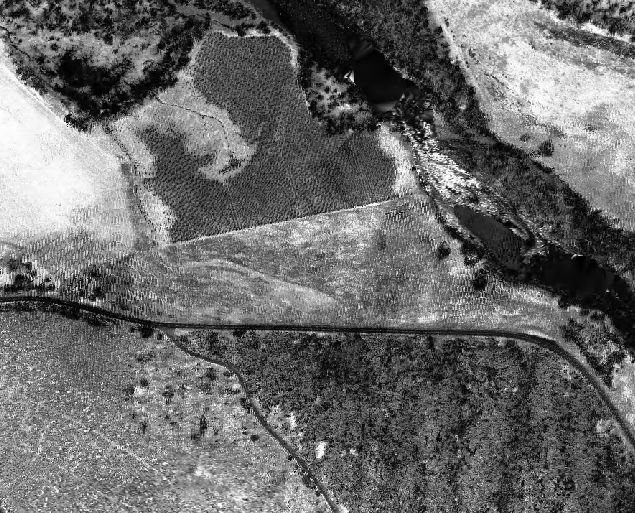 Though its prime use is in conjunction with the lidar elevation data, the images can also serve as a panchromatic (B&W) background. Images are provided in TIFF format and compressed image format.